The living room also includes a round dining room table with 4 chairs. This bedroom includes a jetted jacuzzi tub, shower, vanity with lots of space and a separate area for the toilet. This lovely kitchenette area has everything you may need on vacation. It includes a stove-top, microwave, fridge, coffee maker, sink, toaster & dishwasher. Sofa is a queen-size sleeper sofa, linens provided in downstairs closet. You can enjoy a movie on the TV or just cozy up to the electric fireplace. The bedroom in this unit has a comfortable king sized bed, two bedside tables with lamps, closet and TV with cable. Bask in the sun near the outdoor section of our Indoor / Outdoor pool. Weight machine, treadmill, stationary bike, and eliptical machine await you in our complimentary fitness room. Experience the luxury. You'll want to add just one more night. Upon entering the suite, you encounter the rich hardwood floors complimenting the warmth of the deep chocolate cabinetry. The kitchen features granite countertops and a glass cooktop stove with stainless steel accents. The stainless steel carries over to the refrigerator and the dishwasher. Truly a kitchen the finest chef would feel at home in. If you can't stand the heat in the kitchen, the suite has central air-conditioning. The sofa in the living room converts to a queen-size bed. The glass top table located near the walk-out open patio is perfect for a brunch in the morning light. Each king-size bedroom has clothing storage and cable television. The downstairs tiled bathroom has a shower/tub combo opposite the granite counter on the vanity. 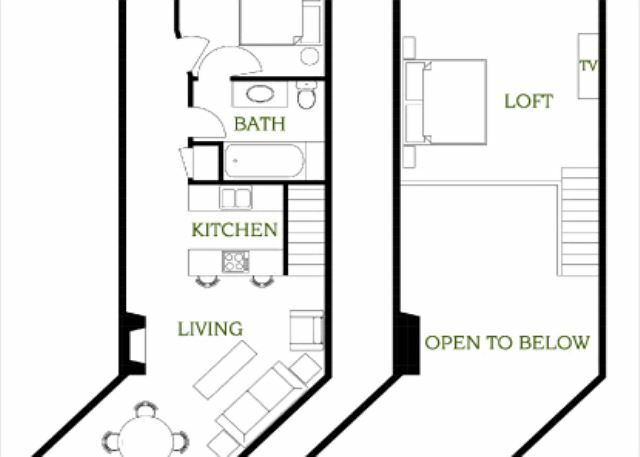 The loft bedroom is where the two-person jetted tub and the separate walk-in shower is located. Perfect space for our family of 6 plus a dog. Room was very clean and exactly as pictured online. They were undergoing some construction so the lobby and hallways were a little dysfunctional but overall a great time. A Relaxing, peaceful stay with a great location. Glad they allowed pets. We stay here for the Charlevoix races. Love that we can walk out the door and be at the Start/Finish line. Also love being able to walk everywhere downtown. 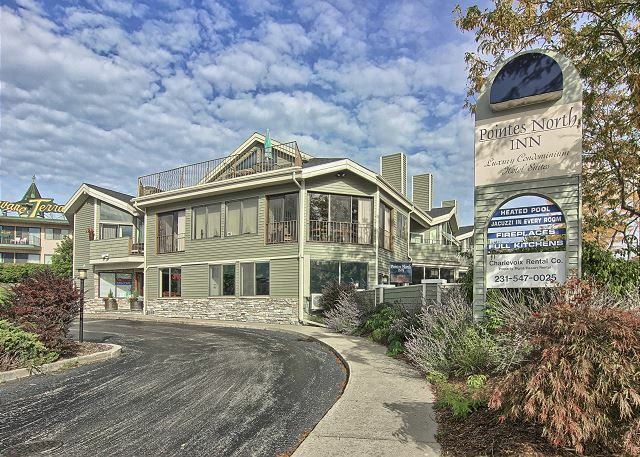 I chose Pointes North Inn for its location to my wedding venue (Castle Farms) and for its larger rooms and had my whole bridal party stay there. my room (208) is where the girls got ready and it was perfect! plenty of space for everyone plus two hair dressers and two makeup artists, and the extra living space was great so that they had a table and natural light! our dogs behaved well and the room was great for them! Thank you for the review Lauren! I'm glad that we had everything you were looking for! Having pet-friendly two-bedroom suites is a rarity for the Charlevoix area and I am very happy that we could accomodate you and yours! 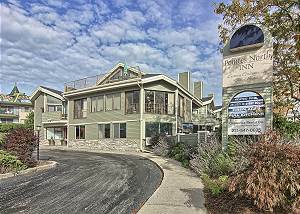 Thank you for making Pointes North Inn your Northern Michigan escape and we look forward to having you again! Overall it was a great mini vacation. One comment - we did not have hot water in the shower and we let Matt, the manager know. 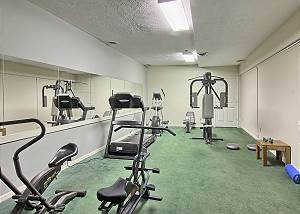 Convenient location within walking distance to downtown shops,sights,and restaurants. The condo was clean,spacious,and comfortable. This was our first time staying in this rental with our 2 kids and dog. The unit was clean and very large. It was like a home away from home. Location was excellent as we were right in town and could sit on our balcony and watch everything. The staff was very friendly and accommodating. Clean unit, clean linens and towels. The staff is excellent. The pull out couch didn't pull out and the couch was lumpy. We were able to get a pet-friendly room on very short notice.